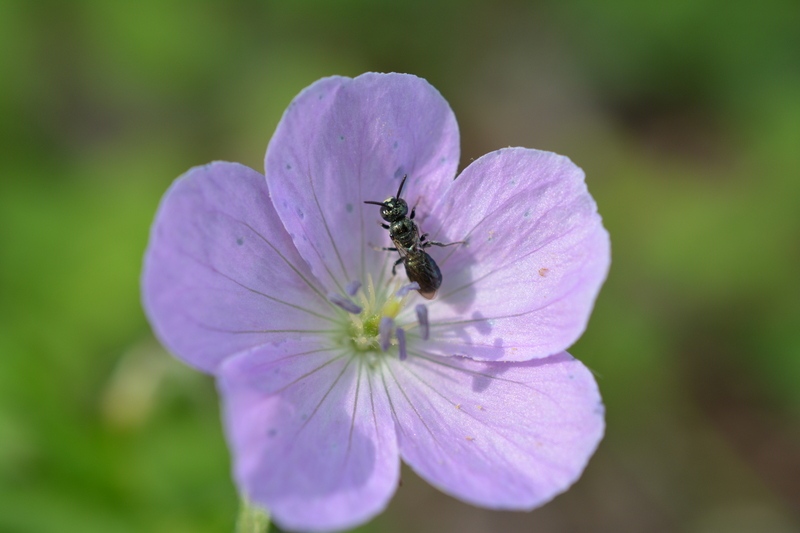 The subtle pink of the wild geranium is popular with spring time bees and its blossoming coincides with the developing leaf canopy that will shade the forest floor. Take a moment to enjoy this woodland flower and note the nectar guides that lure the bee to its sweet reward, a nice exchange for pollination services rendered. Observe the stamens where the pollen is located and notice unlike other flowers that have white, yellow or orange pollen, the wild geranium’s pollen is blue! Why blue pollen? Could it’s unique color be a visual clue to the bee that this pollen is rich in nutritional value? Maybe it just tastes better to ensure the bees visit this flower over other flowers that also seek the attention. 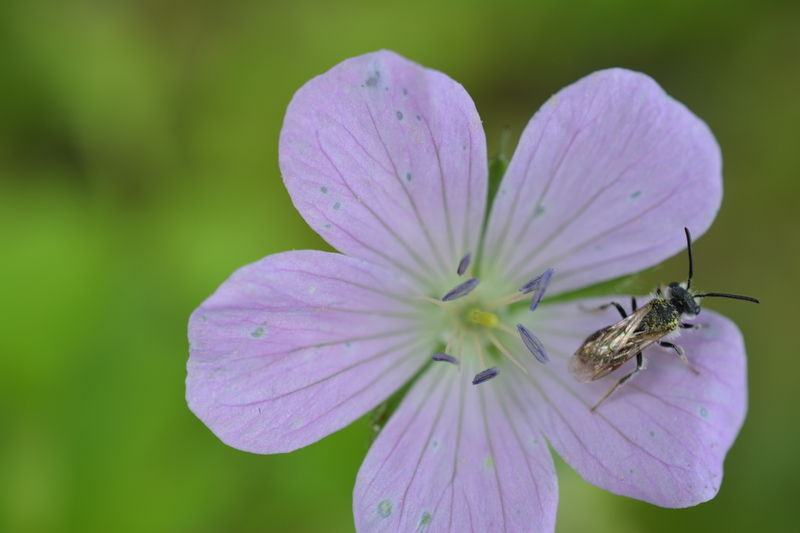 Unlike other flowers, the wild geranium is solely dependent on pollinators, the stigma only becomes receptive once its own pollen is scattered far and wide, thus ensuring that cross pollination will occur. 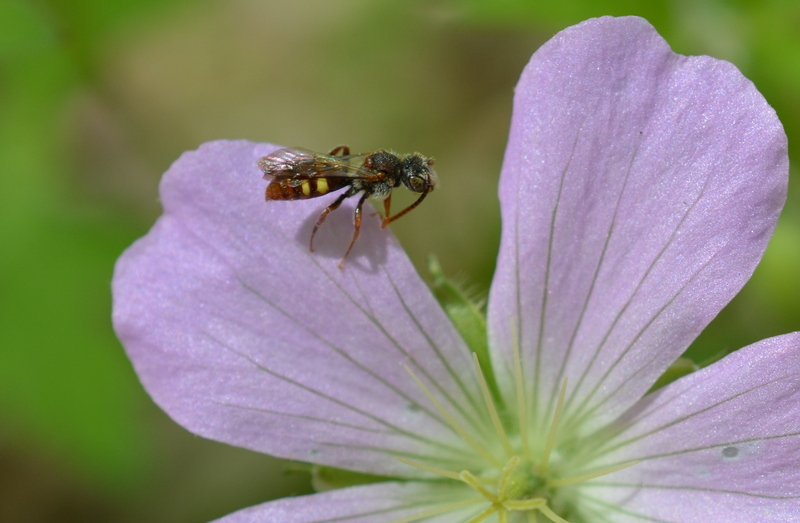 Small Carpenter Bee on Wild Geranium. (Note the blue pollen on the young flower). Wild geranium (geranium itself is a Greek word meaning, Crane) is also known as cranesbill due to very long pistil that resembles the beak of the bird. As the seed pod dries, they curl upward and in the this process eject the seeds far from the parent plant. The more seeds the more successful the diligent pollinators. The dropping of the petals of the wild geranium signals the spring ephemeral season is coming to an end. The bees have finished their work in the forest and will seek sustenance from summer time meadows. Next Next post: Cellophane Bees at Work!